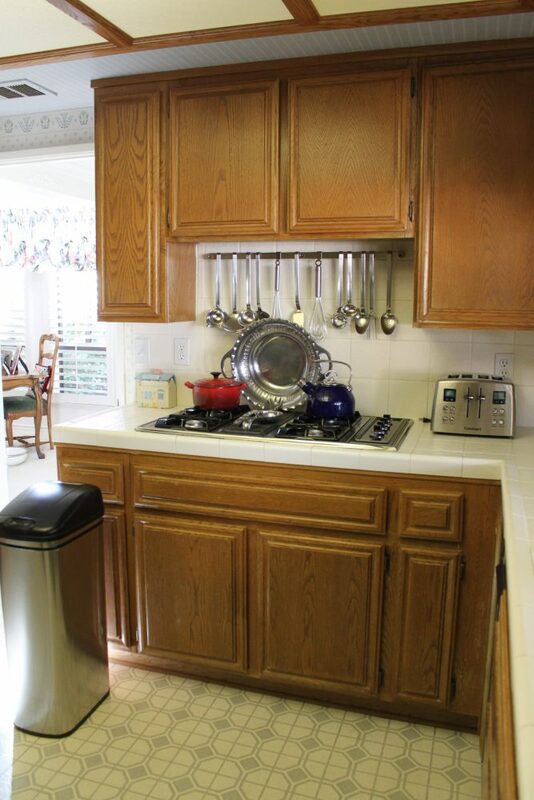 Our latest Project Spotlight features a San Gabriel Valley home in major need of a kitchen remodel. 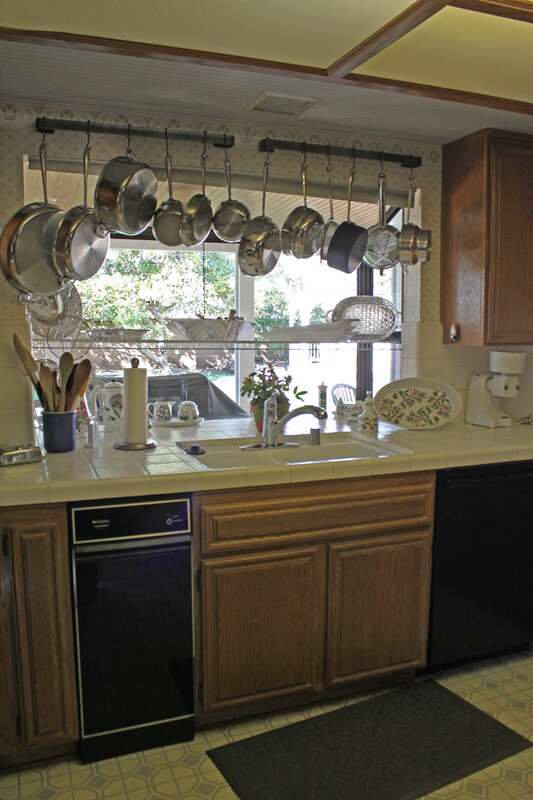 Our client loves to host guests and entertain family and friends, but the original kitchen was too dark and restrictive, and did not allow for any sort of connection with the surrounding areas. She envisioned her new kitchen as a space everyone could enjoy and where she didn’t feel separated from her guests in the adjacent room. We were able to tailor the kitchen exactly to our client’s needs so that she may enjoy a bright, livelier kitchen to better fit her lifestyle. Our approach was to push out and exterior wall and add 24 square feet to accommodate more counter space, larger appliances, and a new island. Equally beautiful as it is functional, the island was an essential design choice for our client as they wanted a workspace that doubled as an entertainment opportunity. 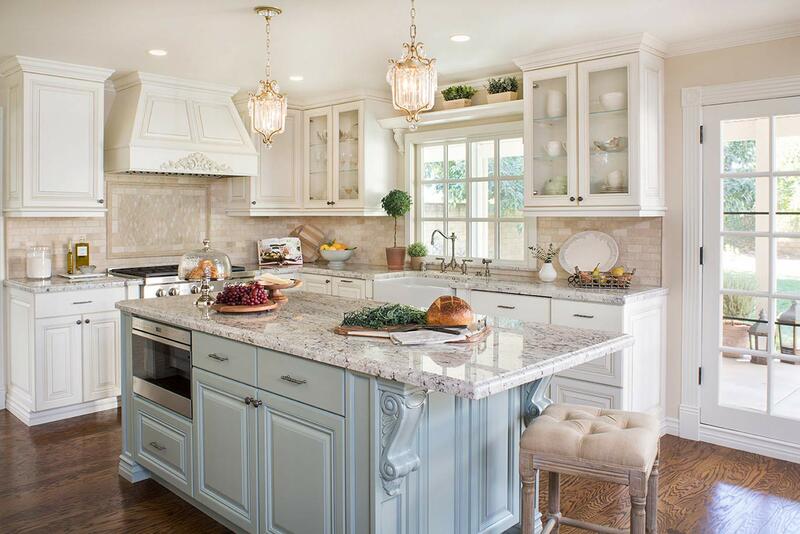 Read more tips on how to best fit an island in your kitchen on Houzz. 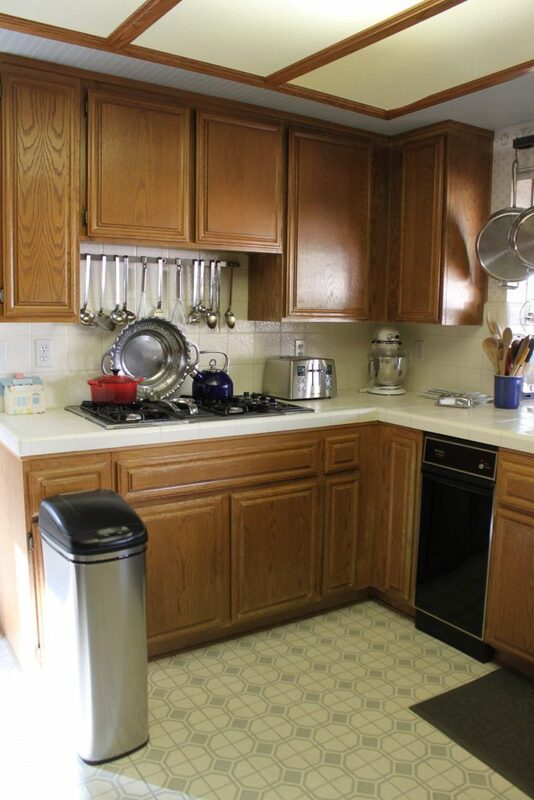 The original kitchen was anchored by a bulky peninsula and upper cabinets that created a strong division between the kitchen and the family room. Although plenty of sunlight touched the home, the dark upper and lower cabinets blocked the kitchen from receiving natural sunlight. 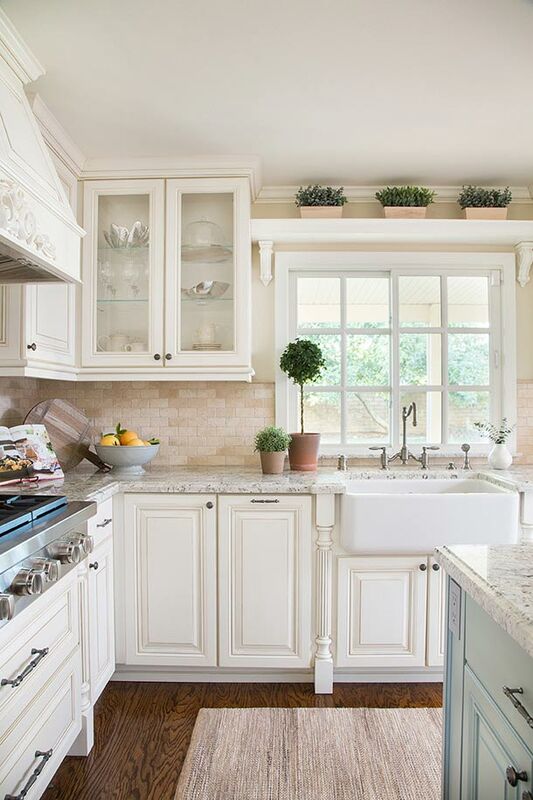 To brighten the room, a soft cream-colored Travertine Tumbled backsplash was used to complement the paint used on the walls and cabinetry of the kitchen. The rectangular-shaped stone decoratively creates an artful break in patterns. The accent piece above the range continues the use of tumbled Travertine in a rhomboid pattern to be in concert with the rest of kitchen. In keeping with bright yet soft tones, polished white ice granite was used on the kitchen countertops to create a dramatic and more contemporary look. 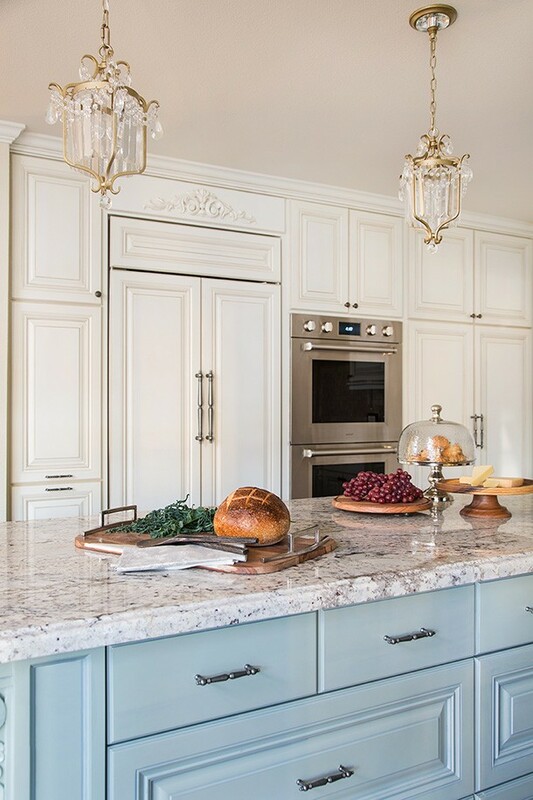 The enclosed range-hood is adorned with scrolled detailing, that relates to the island corbels. The 40” Pro Hood Liner allows for us to incorporate superior ventilation within the kitchen. Continuing the theme of functionality, the new Wolf 36″ Sealed Burner Range Top is spacious with 6 individual burners, and the heavy-duty stainless-steel exterior cleans easily, and beautifully complements the rest of the kitchen appliances. The farmhouse sink portrays a certain charm and quickly becomes one of the focal points to this kitchen. 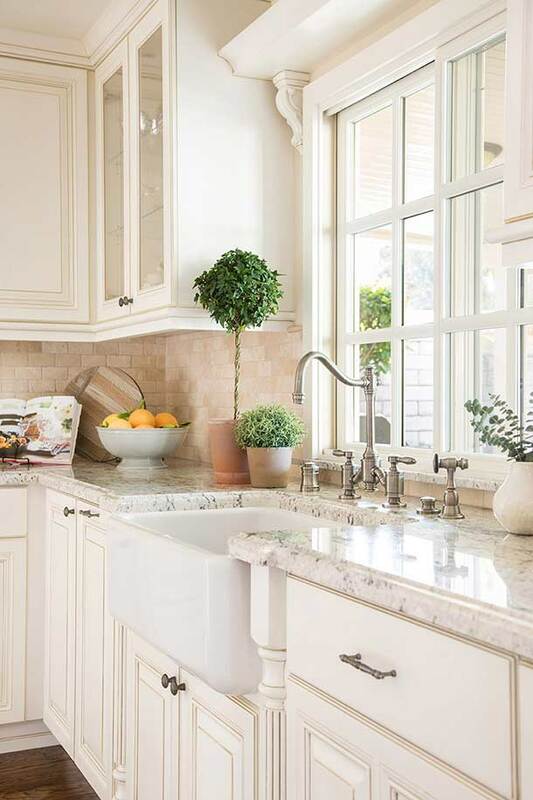 The combination of Rohl Apron Front Sink and Waterstone Annapolis Bridge Faucet embodies charm while losing the outdated feel of the previous kitchen. 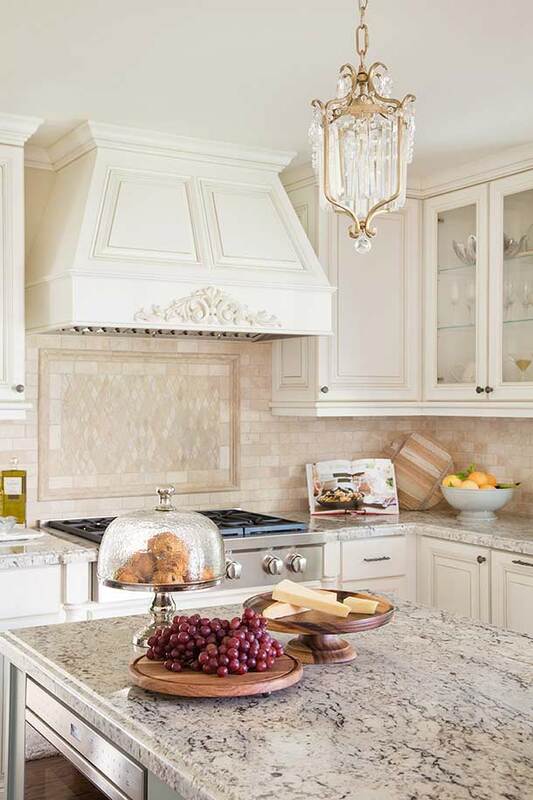 The delicate pendant light fixtures above the island features draping hand polished crystal pieces, which are positioned close to the light source for optimum sparkle. Each piece is hand finished antiqued over real silver leaf. These beautiful collection matches the detailing of the range hood. On the east wall of the kitchen, the double ovens allow for better functionality of the kitchen. Since our client enjoys entertaining on a regular basis, the versatility of owning a double oven was vital. Wolf’s 30” M Series Built-In Double Oven provides precise and intuitive cooking modes, which is something that our client really wanted. She now has the ability to cook various dishes at different temperatures simultaneously. In addition, the 36” Built-In French Door Refrigerator/Freezer provides the perfect and ideal conditions for fresh foods. For even more photos of the Mansion Court Residence, be sure to visit the project portfolio on our website.